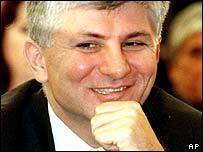 Greek police have arrested one of the main suspects in the killing of Serbian Prime Minister Zoran Djindjic. Dejan Milenkovic, 34, was arrested in Thessaloniki on Friday, with a travel bag with "a lot of money", police said. "We've been on the case for a month and a half. He was unarmed and didn't have identification on him," said local police chief Costas Tzekis. He said Greek authorities were waiting for an extradition request from Serbia for the man nicknamed "Bugsy". The former prime minister was getting out of his official car outside government buildings in Belgrade when he was fatally shot by a sniper on 12 March 2003. Serbian prosecutors say Mr Milenkovic was a member of the notorious Zemun gang - named after a Belgrade suburb - thought to be behind Djindjic's assassination. He is also accused of driving a truck that nearly hit Djindjic's vehicle in a failed assassination attempt just a few weeks earlier in Belgrade. The Serbian authorities believe Djindjic's murder was part of a plot to overthrow the government, sparked partly by opposition to its co-operation with the war crimes tribunal in The Hague, and partly by fears of a clampdown on organised crime. Five out of 13 suspects have been in the dock, including the alleged gunman, Zvezdan Jovanovic.